This article appears courtesy Target Shooter magazine from the UK. Field Target (FT) and Hunter Field Target (HFT) airgun disciplines are popular outdoor shooting sports that simulate the challenges of hunting small game. One of the unique aspects of FT competition is target range-finding using parallax and optical focus. (HFT is limited to lower power scopes, so this type of range-fiding is not used in HFT.) Range-finding is very important because the pellets shot by FT airguns drop rapidly once they leave the muzzle (pellets can drop roughly 5″ at 50 yards). If you don’t have your scope set to the correct distance, you’ll probably miss the target high or low. FT competitors employ high-magnification (35-55X) scopes to sight targets placed from 10 to 55 yards (7.3 to 50m in the UK). Because these scopes have very short depth-of-field at high-magnification, the target will be out of focus unless you have the scope focus/parallax control set very precisely. But competitors can use this to their advantage — once the target is precisely focused, you have effectively established its distance from the shooter. FT scopes often have large-diameter wheels on the side parallax control so the focus can be set very precisely. You can then read marks placed on the scope to adjust the amount of elevation need to put the pellet on target. To simplify the adjustment of elevation on FT rifles, competitors will place tapes on the windage knobs with marks that correspond to distances in 3-5 yard (or smaller) increments. These marks allow you to quickly spin your elevation to the setting matching the target range established with your focus/parallax control. There are a variety of specialized products for FT competitors that help you set up your scope for precise ranging. First, Compufoil offers a computer program, ScopeKnob, that lets you easily create accurate elevation knob tapes for your scope. ScopeKnob even comes with a built-in Ballistics Module that will calculate the pellet trajectory for you and plot range settings for your tape. Chairgun.com also offers ChairGunPRO, specialized airgun ballistics software that lets you simultaneously compare four different pellets, or different scope heights. In the past, the A-Team offered replacement elevation knobs optimized for use with yardage marking tapes. These were offered in two versions, one which replaced the existing turret altogether and a second which clamped OVER the factory turret. Shown at right is the larger-diameter version in place over the factory turret. Unfortunately we don’t know a current source for this product, but this may help you crate something similar on your own. Last but not least, Pyramid Air offers large-diameter parallax control wheels. According to Pyramid: “The enlarged sidewheel is the most popular FT scope accessory of all. It lets you put white artist’s tape around the rim to mark the actual distances at which the scope focuses”. A 6″ sidewheel provides over 18″ of space on which to inscribe yardage, and that means you can have a meaningful separation between 18 yards and 20 — where there is a huge parallax and trajectory difference. 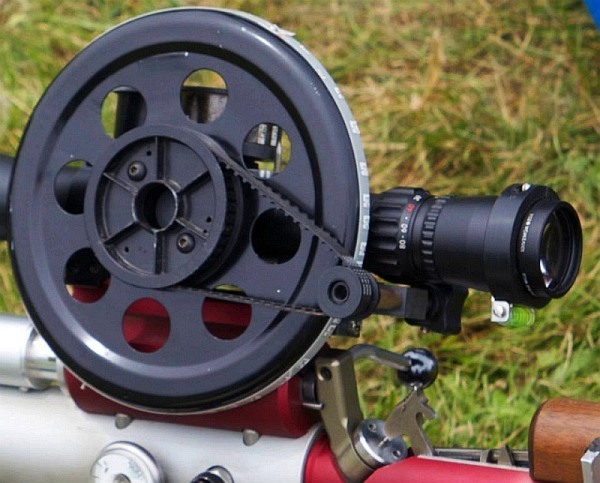 Though the ranges are already engraved on the rim of the wheel, field target competitors will measure them again on an actual range and write the markings on a strip of white artist’s tape. Share the post "Field Target Tip: How to Range Targets Using the Scope"
Speaking of decapping tools, MidwayUSA has the Lee Universal Decapping Die on sale this month (June, 2010), for just $9.89 (item 136543). There are many situations when you may want to remove primers from fired brass as a separate operation (prior to case sizing). For example, if your rifle brass is dirty, you may want to de-cap before sizing. Or, if you load on a progressive press, things will run much more smoothly if you decap you brass first, in a separate operation. The Lee Universal Decapping Die will work with cartridges from 17 Fireball all the way up to 45-70. However, NOTE that the decapping pin supplied with this Lee die is TOO LARGE for LAPUA 6.5×47, 6BR, 220 Russian, and Norma 6 PPC flash holes. Because the pin diameter is too large for these brass types, you must either turn down the pin, or decap with a different tool for cases with .059″ flash-holes. Otherwise, the Lee Decapping Die works well and it’s a bargain. Share the post "Reloading Tip: Set Your Decapping Rod Insertion Depth Correctly"